Arsenal striker Yaya Sanogo set for a loan move Premier League side Arsenal are set to send their young striker Yaya Sanogo on loan in the coming transfer window. 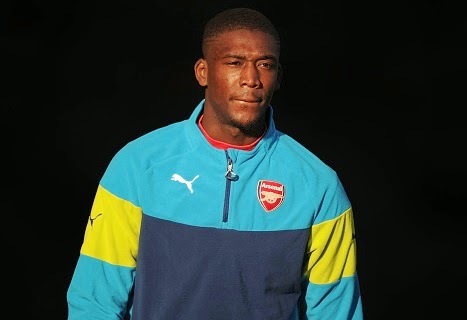 Premier League side Arsenal are set to send their young striker Yaya Sanogo on loan in the coming transfer window. Arsenal boss Arsene Wenger has decided to loan his French striker Yaya Sanogo out in January so that he can further develop. Sanogo has not shown any impressive signs at the Emirates. The boss believes that it will be good for him to have some regular time out on loan. The 21-year-old Frenchman who joined on a free transfer from French outfit Auxerre in 2013 has scored only a goal in eight starts. Intotal, he has made 19 appearances for the North London side. Sanogo is likely to prefer a move to Premier League to gain some Premier League experience so that he can help the Gunners in future. Arsenal already have experienced strikers Olivier Giroud, Lukas Podolski, and summer signing Danny Welbeck. The games Sanogo played were only because of Giroud’s injury but since his return Sanogo is struggling. Even Arsenal don’t have a room for German attacker Podolski. Theo Walcott is also set to return which means Sanogo could lose his bench place even. Staying at the Gunners will not help him for the future, it is better to leave and spend some time in team where he can get more playing time.